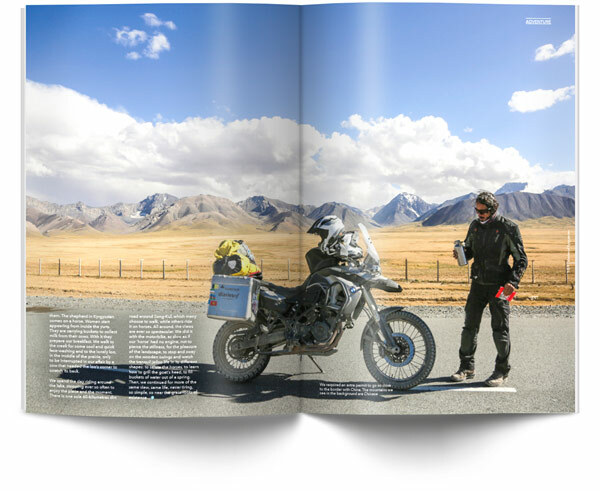 Yes, we faced a few challenges when driving our motorbike through Kyrgyzstan: searching for a garage that sold off-road tyres, tackling with bad quality petrol or having our first puncture. Despite all this, the country is unrivalled in terms of dirt roads through the mountains…. In the country of Nomads, it is not surprising that many of the encounters happened in the jailoos (the mountain pastures) where we met Kyrgyz that came from different walks of life. 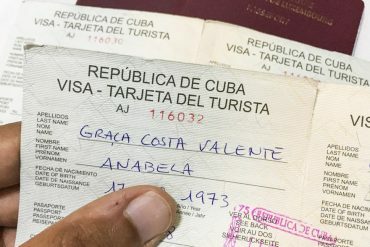 Only here you get the same chances of meeting a lawyer and a circus artist doing the same job, and both as proud of their cultural nomad heritage. 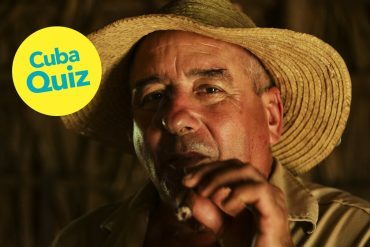 Here, the chances are high that you will come across a manaschi, a falconer and a horseback archer. 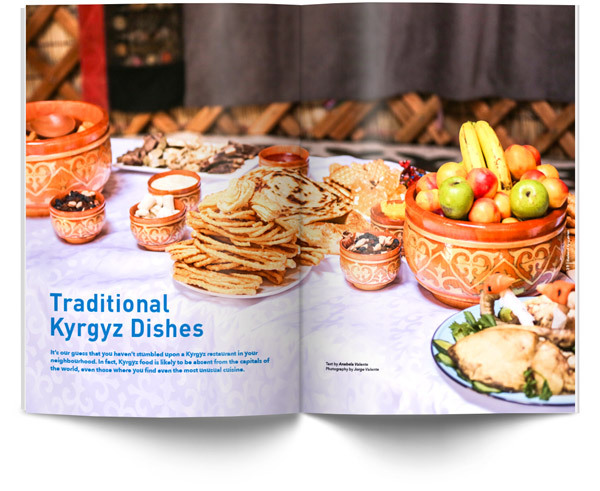 Kyrgyzstan’s cuisine is almost a mystery to the majority of the visitors. Who has found a Kyrgyz restaurant outside the country? Expect to find many tasty dishes that rely a lot on meat. You will challenge your taste-buds when trying the fermented mare’s milk (kumis) and the typical salty cheese balls (korut). In this video, we have put together some of the best drone shots and some of the best experiences we had while riding our motorcycle around Kyrgyzstan! 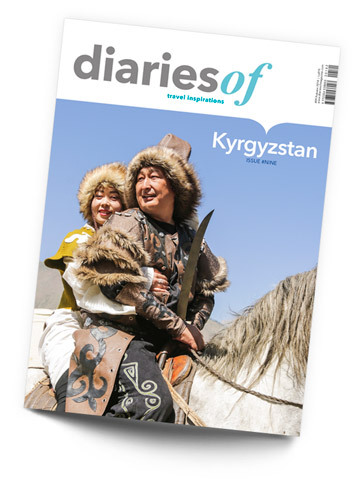 In issue number #9 of diariesof magazine, we will take you on a unique (time-travel) adventure to Kyrgyzstan. I really liked it. 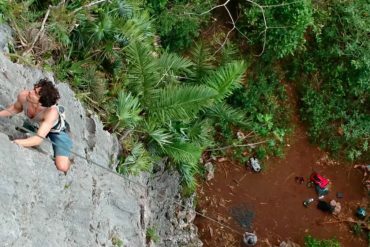 Keep on doing what you do – really inspiring! Well written and informative, great photography. Lots of great photos inside and great to see a culture represented in depth. 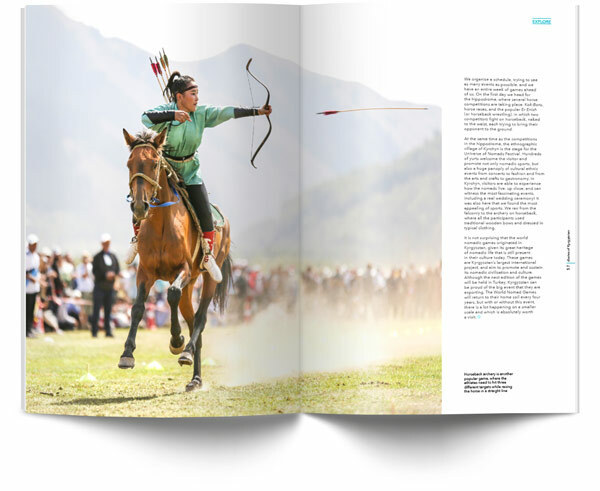 Let yourself be charmed by the last nomads of Kyrgyzstan, their culture and the world-famous nomad games, that include horseback ‘polo’ and wrestling, the art of falconry and archery. Read this experiential diariesof issue about Kyrgyzstan and be inspired to venture out on your own journey through Kyrgyzstan. Get your copy now! Not much is free these days, but our shipping is! If you are not happy with your purchase we’ll refund you with no questions asked. with Visa, MasterCard or PayPal.